This will take you through a simple set of choices, to ensure your Insight is tagged in the right manner and is displayed to the right people. Quite a few of the choices over the next few screens will be pre-populated and will require you to only click through. Thus, the entire post-composition process is unlikely to take more than two to three minutes of your time. 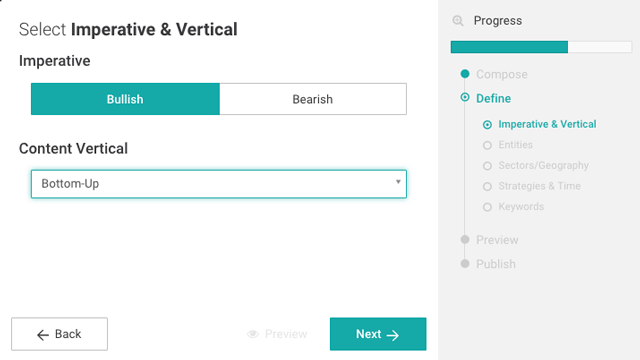 The first selection is to choose whether you are bullish or bearish on the underlying stock/sector/market that you have written on. Next, you will have to choose the type of Content Vertical that the Insight will be classified under. Most Insight Providers will see limited, self-explanatory options in their list. At any stage of the process, you can use the back button to change any of your previous choices. You must select a Primary Entity, i.e. the stock, sector or market that is the focal point of your Insight. For top-down pieces, you will not see this section and will proceed to selecting Country/Region & Sectors (the stocks tagged for Top-Down will also be driven by the Entities tagged in the insight using the “$”). If you cannot find the Entity you are looking for, please send an email to [email protected] and we will do our best to respond promptly. The Additional Entities box should be used to add tags to additional companies that might be impacted from your Insight. This is a non-mandatory option and can be left blank. 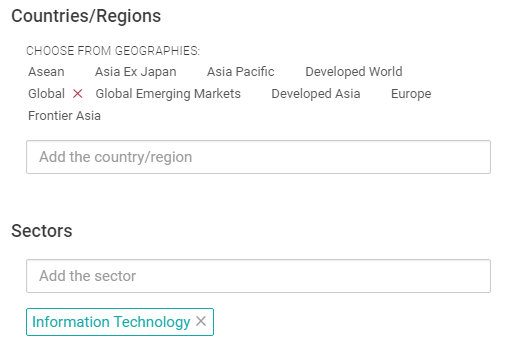 Your earlier selection of Primary Entity will result in a default country/region and sector selection. These are predefined but can be altered in case you feel the need to do so. However, keep in mind you must select at least one country/region and one sector. For top-down pieces, your choice of country/region and sector shows the focus of your Insight. You should see a predefined selection for Strategies & Time Horizon. A click on the Strategies box will give you the relevant options which may be selected. You can edit the predefined choices and add other choices. You are required to select at least one strategy. You will also need to select a time horizon over which you expect your idea to play out. This is to give the reader an estimate of the timing expectations for returns. As a final part of the definition and tagging process, you should see all the keywords that have been pre-selected to tag your Insight. You can add more keywords using the text box (type a word or phrase and hit return - the ones you will add show up below the entry field). You can also delete pre-selected keywords you feel are not relevant by clicking on the "X". 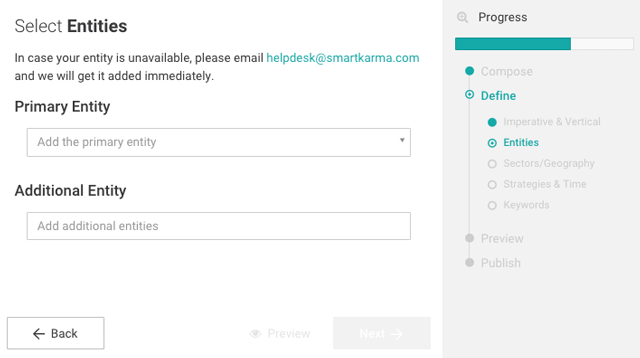 These keywords, along with the other main tags, will be used to help Smartkarma users search for content on the platform. 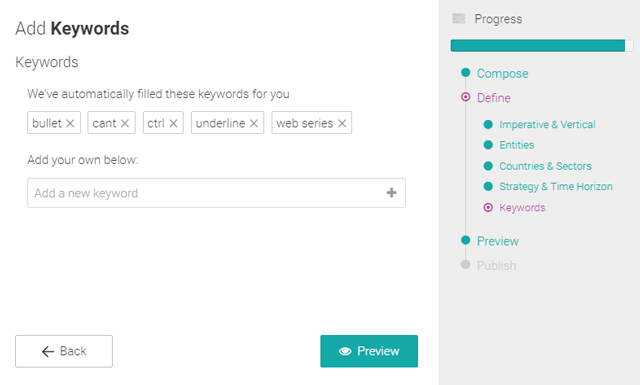 Once you click on the Preview button, after selecting keywords, you will be able to get a glimpse of how your Insight will look when it's finally published. If you find something amiss, click on the Edit button in the top right corner of your screen (or the link in the yellow bar at the bottom) to go back to Compose mode and edit your Insight. 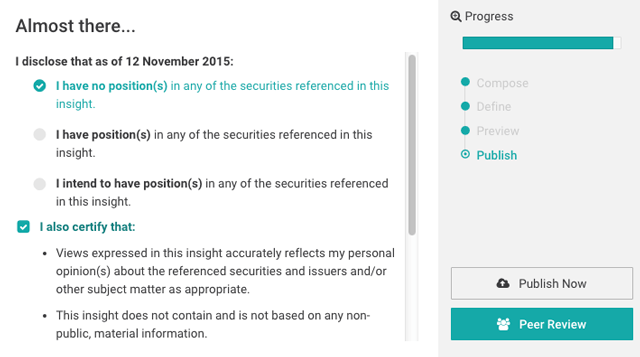 If you are part of an Insight Provider Company, you will have the option to either publish under your own name or under the Company’s name (subject to the option being enabled by your Compliance Officer). If everything looks fine, click on the Publish button in the top right corner to publish your Insight. Once you decide to publish, you will be prompted to select an appropriate disclaimer about your interest/involvement in the underlying Entity. You then have the option to either put the Insight through a 24 hour Peer Review, where your fellow Insight Providers can provide valuable inputs, or to publish right away. At Smartkarma, we are big believers in collaboration and thus, we encourage our Insight Providers to submit their Insights for Peer Reviews, unless the Insight is time sensitive, requiring it to be published immediately. 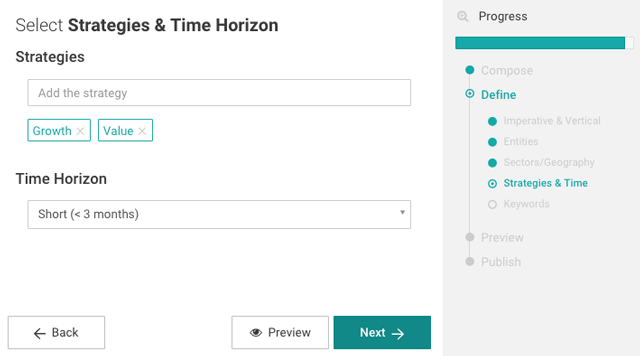 New Insight Providers will have their first three insights go into Peer Review automatically so as to enable peers to provide feedback before the Insight is published. For more details on Peer Review, please have a look at the Peer Review section.